Enter your email address below to receive a notification when The KitTea Kit starts accepting new sign-ups! 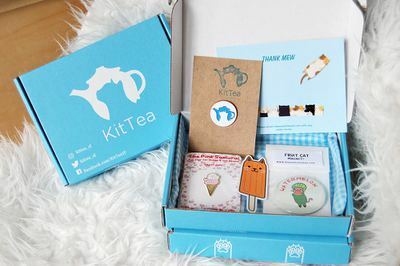 Enter your email address below to receive a notification when The KitTea Kit is accepting new sign-ups again. A monthly delivery of purrfectly curated merch, pins, patches, socks and other accessories! All KitTea Kits are shipped on the 4th of the month and will arrive within 3-5 business days for most US shipping addresses. Please order by the 15th to get the upcoming box (ie. Order by January 15th to receive the February box). You will receive an email when your KitTea Kit ships, so you can track it to your doorstep. 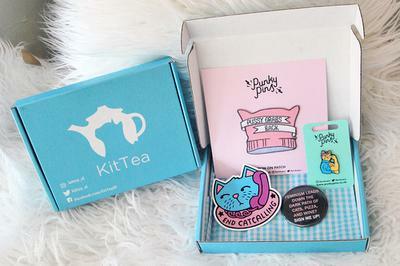 Join The KitTea Kit subscription to receive a monthly delivery of cat-tastic, cat-centric samples, lapel pins, patches, socks and other fur-bulous accessories for yourself, or the cat lady in your life. 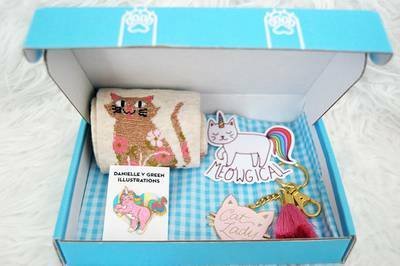 Each monthly box comes with 3-5 items ranging from lapel pins, patches, buttons, stickers, socks, and meowch meowr! You get the bling - your cat gets the box! I love cats and the idea of the KitTea Cat Cafe and other cat cafes in general. Unfortunately, I don't live near any of them. I was excited to see a subscription box that was put together by a cat cafe, so I subscribed to the monthly Kit Tea Kit. In the May 2018 kit, I received a pair of socks, key chain, iron-on patch, and an enamel pin. The socks have a cat's face (wearing sunglasses) with "MEOW" underneath. I will definitely wear them! The key chain is white, pink, and gold. The main part of the key chain is a heart with cat ears/paw prints and says "Cat Lady". It's adorable and I have already put it on my keys. The iron-on patch is the same design as the key chain and looks really cute. Unfortunately, I don't use patches so this will be the only item I will be gifting. Lastly, the enamel pin is fantastic! It's my favorite item that was included in the box. It's a cat wearing a leather jacket and there's a tipped over glass on the jacket. It's humorous and adorable! The shipping was fast and everything arrived in perfect condition. The packaging was nice and simple. I will continue to subscribe to The KitTea Kit and recommend it to fellow cat lovers! 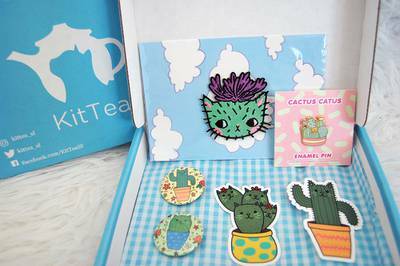 I was at first hesitant to purchase the KitTea Kit due to the price, but decided to take the plunge, because I love cats and all things cats related, not to mention this box is for a good cause!